More and more Vietnamese are adopting the practice of going meat free in the first month of Lunar Year, not only for religious reasons – the 15th day of the month is one of the biggest days for Buddhists. In fact, fed up with meat dishes served at every gathering during Tet, many have opted for vegetarian or pseudo-vegetarian meals after the long holiday. 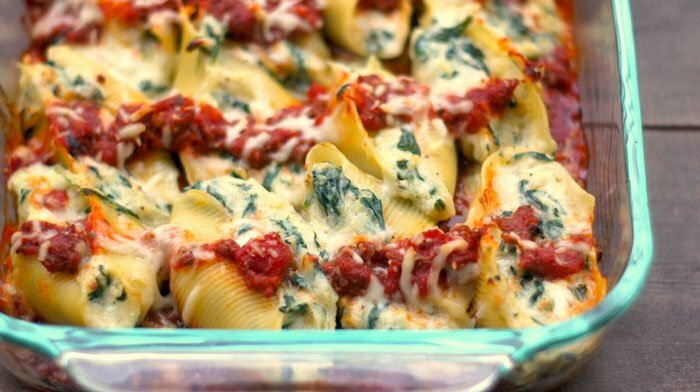 And to diversify your meatless meals during the month, Vietnamese vegetarian dishes aside, you always can try new and flavorful recipes from the West such as the spinach-stuffed pasta shells. As it is one of the recipes preset in Häfele’s ICONIC oven, you can make the food easily with the assistance of the smart function Cookbook. 1. Rinse the spinach; place it in a saucepan on a high heat. Cover and steam for 3 minutes, stirring frequently. When the leaves shrink and soften, put them in a colander and set aside so the spinach cools. 2. Put the courgette and half of the garlic into a saucepan. Add the stock, bring to a boil and cook on a high heat for about 3 minutes until the courgette is tender. 3. Put half of the ricotta, walnuts, 2 tablespoons of Parmesan, salt and pepper into a blender and blend it smoothly (the sauce should be thick). 4. When the spinach cools, squeeze it dry and chop it coarsely. Stir in chervil (or marjoram), courgette, chives, basil, garlic and the rest of the ricotta and egg to make the stuffing. Season it with salt and pepper. 5. Preheat oven to 190°C. Fill the shells with the stuffing. Place them in a casserole dish. 6. Pour over the sauce, sprinkle with the rest of the Parmesan cheese, cover tightly with aluminum foil and bake for 30 minutes. 7. After removing it from the oven, sprinkle with Edam cheese and basil. Let the cheese melts before serve. The spinach and herbs can be replaced with green vegetables – chard leaves, borage and dandelion. 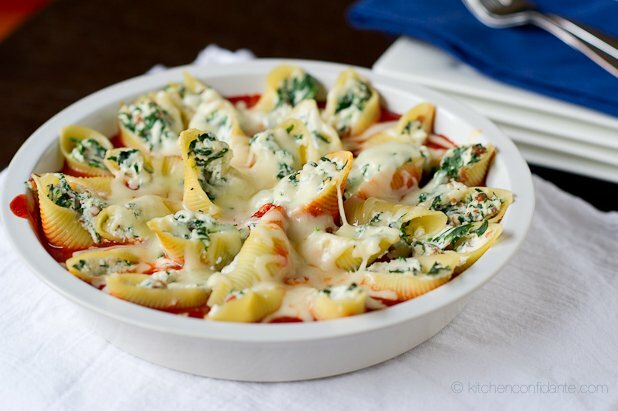 Tomato sauce is a perfect replacement for the cheesy sauce. To make tomato sauce, put crushed tomato (a canned one is good enough) together with some dried oregano, dried basil, pepper, salt and sugar into a saucepan. Bring it to a simmer and let it simmer for 10-15 minutes.